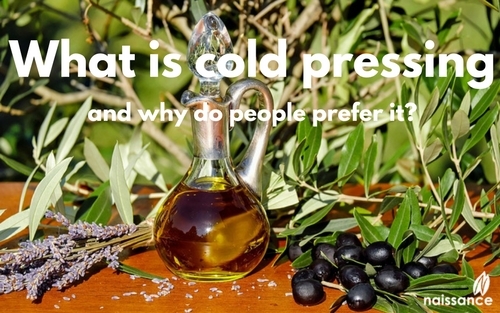 What is cold pressing and why do people prefer it? If you don’t know the difference, you really need to read this, it could make you re-think how you buy your oils! There are various ways of extracting essential and carrier oils. One of the most popular forms of extraction is cold pressing, which does not use added heat, solvents or other chemicals to extract the oil from the fruit, nut, seed or petals, and maintains as much of the nutrients in the oil as possible. Although the extraction process is called cold pressing, the process is generally not completely cold as heat is naturally generated when a nut, seed or fruit is pressed. Manufacturers must keep the temperature within a certain range to call the oil cold pressed. When extracting Jojoba Oil the temperature cannot exceed 45 °C. Cold pressed extra virgin olive oil for cooking cannot exceed 25 °C. 1. The process begins with filtering. The seeds will be passed through a series of spaces with an air-propulsion system, removing any impurities. 2. The nuts, seeds, or fruits are ground into a paste using heavy granite millstones or the modern stainless steel presses, which are found in large commercial operations. 3. The semi-solid paste is slowly stirred, often with a rotating screw which encourages the oil to separate from the solid parts and clump together. Once this happens, pressure is applied to force the oil out. It is one of the most important moments of the whole process, since this pressure may increase the temperature of the oil. If it exceeds a certain temperature, the oil may lose some of its properties. 4. The pressed oil goes through a series of filters that separate small pieces of peel or pulp from the oil. The final part of this filtering process involves passing the oil through a mesh to ensure that all impurities are removed from the oil. This method of oil extraction requires lots of fruits and seeds. For one litre of Argan Oil up to 30kg of seeds will be used. The discarded parts do not go to waste, they are used for animal feed or fertilizers. 5. Once the filtering process is complete, a decantation process is carried out. Any remaining sediment is separated from the oil by the simple force of gravity. Thus, a 100% pure and natural oil that retains all its properties is obtained. Did you find this information about cold pressing informative? Will it change how you buy your oils? Please let us know. Coming up Monday … Our latest organic product launch for Organic September 2016 – This one is more intimate in nature! You may be finding times hard financially and you want to be responsible with your spending, but that doesn’t mean you have to lower your standards. So read on to discover ways to maintain your organic lifestyle which won’t cost the Earth!